Make Your Google Business Listing Fly! On July 24, 2014, Google released another algorithm update with the code name Pigeon. The aim was to give preference to local search results. Moz did a comprehensive survey on local search ranking factors in response to the Pigeon update. The survey lists several factors participants thought influenced rankings, including signals from a business page on Google, on-page signals, social signals, review signals, and more. While not definitive (as nothing about SEO is), the survey has provided us with a good insight to how the boost the presence of any business in Google. When you think hard about your own browsing habits, how often do you look past the first few results that show up on Google Maps? It’s highly likely you look at the number of reviews on what shows up on top, and move on from there to other review/ratings site like Yelp. Obviously, you can’t control every factor that influences how your business is ranked on Google. For example, Moz has repeatedly cited domain authority is something that’s hard to influence. If you get a load of bad reviews, you can only partially control them. But there are many things you can still control and improve on to rank better in Google Maps. Here are 7 of the most effective tricks and techniques! It’s free, and more importantly, you can’t even get in on the whole Google Maps game without it. Your website should include your City/State in a title tag, H1 heading, content, alt text on images, etc. These are old basics but worth revisiting, as Google expects certain local signals from your site. It’s surprising how many businesses don’t claim their Yelp page. While Yelp can feel like a cesspool sometimes, it’s still the most authoritative site when it comes to reviews and ratings. While you’re at it, make sure your business shows up on other local business directories like YellowPages.com. Optimising your listings is probably the most important thing you can do on this list. Make sure your information (name, address, phone, hours of operation, etc.) is uniform across all directories and matches what’s on your Google business page. Encourage customers to leave reviews on all the sites mentioned above, especially on your Google page. Reviews are the lifeblood of your business. It’s a deeply rooted psychological fact that people like social proof, and, essentially, that’s what reviews are. You’ll inevitably come across a few negative reviews. In this case, quantity over quality is the rule. More positive reviews will eventually dilute the negative ones and you can look forward to a pristine 4.5-5 star rating on Google. This isn’t directly related to ranking better on Google Maps, but it’s important nonetheless. Once you realise the importance of local SEO, you have to stay on top of it. Interact with your customers. Refute negative reviews (within reason). While your website still plays a role in getting you exposure, your potential customers will most likely come across your business through the results on Google Maps. You need to strategise accordingly to grow your business. If you chose to hire an SEO company to promote your business, always chose one that is local to you. 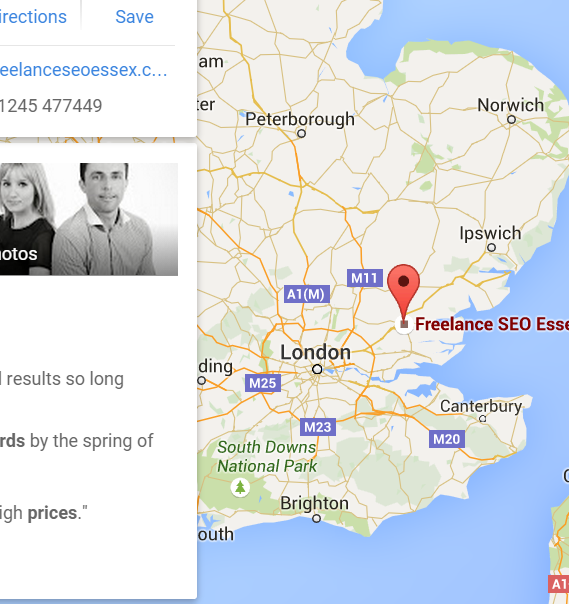 For all my Essex and London readers, I would, of course, highly recommend Freelance SEO Essex – they really know local well. It is so much harder for an SEO firm in India to rank a website well in Chelmsford, when they do not know the area at all!